For all-weather protection in Brisbane, ask for Rainbow Shade fabrics! Brisbane is no doubt one of Australia’s most liveable and desirable locations. This is of course due to a variety of factors, one of which is its weather. With an average temperature of 26°C, summers in Brisbane are generally spent outdoors soaking up the sun. However, spending too much time in the sun can cause many health problems. For this reason, you will notice that there are many shade sails in Brisbane’s suburbs. Rainbow Shade is proud to state that many of these shade sails are made out of the shade fabrics that we supply. At Rainbow Shade, we’ve been supplying high quality shade fabrics to shade sail manufacturers in Brisbane and across Australia for over 25 years. Our shade fabrics conform to the highest standards of quality and because of this, we are known as an industry-leading supplier. Not only are our shade fabrics highly durable and weather resistant, but they also offer incredible UVR protection. While Brisbane’s weather is mostly sunny, from time to time it also experiences thunderstorms, torrential rain, heavy winds and hailstones. However, this need not be a problem for shade sails that are manufactured with one of our fabrics. Brisbane residents and businesses can achieve all-round weather protection by requesting a Rainbow Shade fabric for their shade sails. Currently, our product range includes four types of fabrics, namely DRiZ, eXtreme 32, Z16 and Mehler. Our DRiZ shade fabric is especially popular for shade sails in Brisbane, as it suits the needs of both residential and commercial customers. This fabric is highly durable, lightweight (280 GSM) and incredibly easy to setup, dismantle or maintain. Moreover, DRiZ is resistant to all weather conditions – it is waterproof and offers unmatched UVR protection of up to 100%. It is also available in a range of 16 colours. Z16 is the most popular fabric for shade sails, not only in Brisbane but also all over the world. Incredibly lightweight (200 GSM), highly durable and tensile, this fabric can withstand even the harshest weather conditions with ease. Z16 is proven to offer UVR protection of up to 99%, making it perfect for use in Brisbane’s weather. If you’re looking for stylish shade sails in Brisbane, Z16 will do well to meet your needs as it is available in 22 colours. We even offer an outstanding 10-year warranty on this fabric. Across Brisbane, commercial shade sail manufacturers prefer eXtreme 32. This is because it is dimensionally stable, fire rated and requires little to no maintenance. It is slightly heavier than our other fabrics (320 GSM) and offers great UVR protection of up to 95.8%. Many shade sails for pools, car parks, schools and other large areas in Brisbane are made out of this fabric. As with the Z16, we offer a 10-year warranty on eXtreme 32 as well. Mehler is a unique PVC waterproof fabric that is ideal for use in heavy-duty commercial applications. Featuring high durability, exceptional strength, fire resistance and high stability, Mehler is designed to withstand any weather condition. This fabric is also UV rated and fungicide treated for extra longevity. Mehler have put in over 60 years of development behind their products and that’s why it is used extensively in commercial applications across Brisbane. The biggest reason why we are Brisbane’s leading shade fabric supplier is because our products are suitable for various applications. Our products are designed to meet the needs of both residential and commercial shade sail applications. Our fabrics are already being used in shade sails in schools, outdoor pools, car parks, restaurants and cafes across Brisbane. View our applications page to see examples of some of the shade sails around Brisbane. What to look for in shade sails in Brisbane? 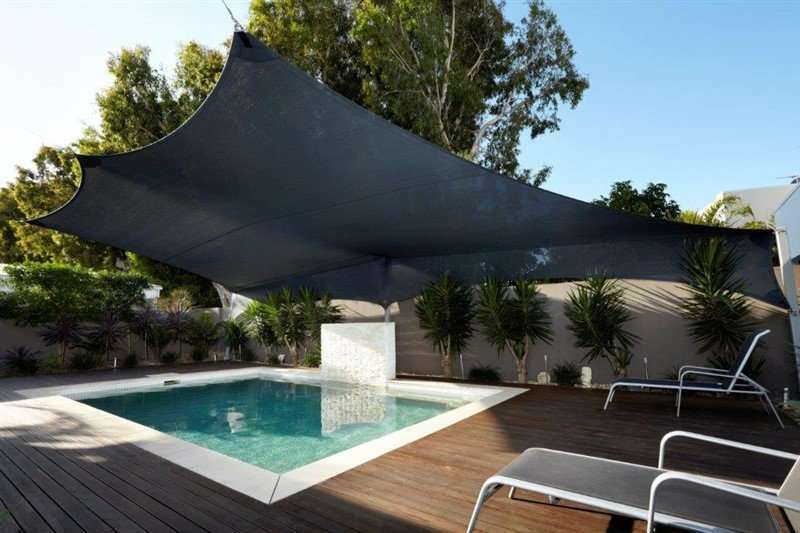 If you’re looking for shade sails in Brisbane, then it is very important that your shade sail fabric offers maximum UVR protection, while being durable and easy to maintain. Your shade sails must also be able to withstand winds and rain. Thankfully, Rainbow Shade fabrics meet and exceed all these criteria. We supply our shade fabrics all across Brisbane, including the suburbs of Acacia Ridge, Archerfield, Ascot, Ashgrove, Aspley, Auchenflower, Bald Hills, Belmont, Bowen Hills, Bracken Ridge, Burbank, Carindale, Chermside, (Brisbane) City, Eagle Farm, Eight Mile Plains, Ferny Grove, Forest Lake, Fortitude Valley, Greenslopes, Hamilton, Holland Park, Indooroopilly, Kangaroo Point, Kelvin Grove, Lutwyche, Manly, Mount Gravatt, New Farm, Newmarket, Newstead, Northgate, Nudgee, Oxley, Paddington, Rochedale, Rocklea, Shorncliffe, South Brisbane, Spring Hill, Toowong, Wavell Heights, West End, Woolloongabba, Wynnum, Yeronga and everywhere in between. As such, you can be certain to find a shade sail manufacturer near you who uses our high quality fabrics. Give us a call at 07 5580 5366 and we’ll put you through to your nearest Rainbow Shade partner. Don’t look for shade sail manufacturers elsewhere – contact one of our partners to enjoy maximum weather protection in Brisbane.